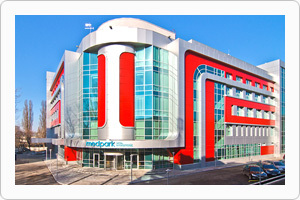 The Medpark International Hospital area covers a total surface of 12 500 sq.m. The 6-floor modern building includes emergency unit, polyclinic, in-patient department, maternity and pharmacy. The in-patient department consists of exclusive accommodation in one-bed 63 rooms including 6 VIP rooms, equipped with advanced systems of vital functions supervision. The rooms of our hospital are destined to provide you with the ultimate privacy and comfort, offering such necessary facilities as air conditioning, satellite TV, Internet, telephone, refrigerator, separate shower and WC and other services required by the patient. The comfort and safety of our patients is amongst our top priorities.